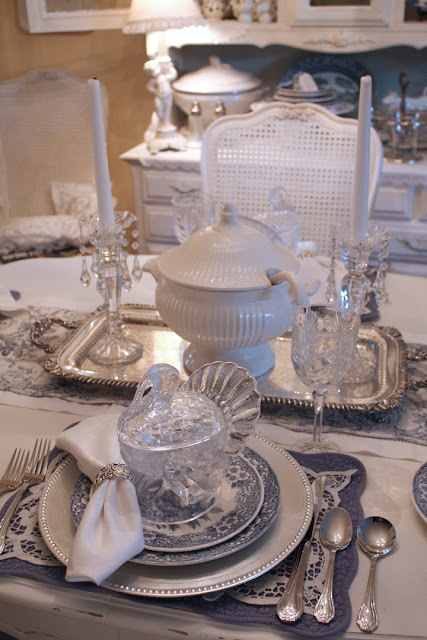 This week I know many of my friends in the U.S. are getting ready for Thanksgiving next week so I decided to re-share my very non traditional Thanksgiving table I did a few years ago. I found these turkey candy dishes and turkey plates at Marshalls a few years ago and fell in love with them! I used the turkey candy dishes as soup bowls! 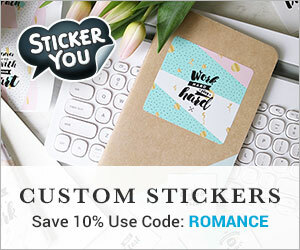 I remember seeing Martha Stewart do this a very long time ago and I loved this idea so when I found these for a really good price I bought 4 of them. 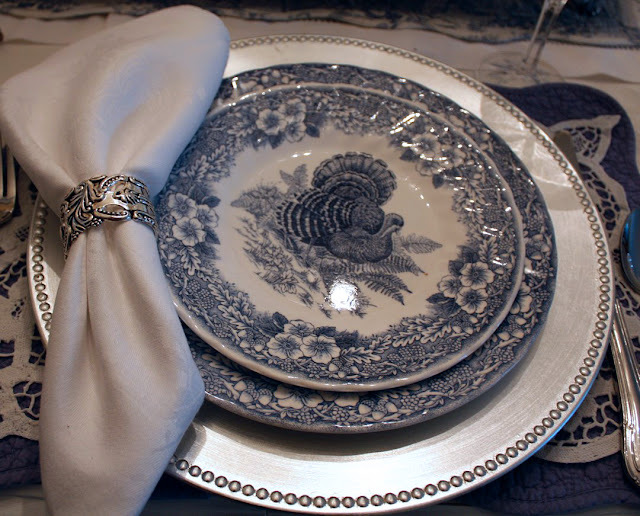 These blue turkey dishes were perfect for my blue home! They are traditional because of the turkeys but very non-traditional because of they aren't the usual autumn colors. Unfortunately, I won't be using them this year because we are going to my dad's house for Thanksgiving and my brother is making dinner. My brother does cook an amazing Thanksgiving dinner though! Thanksgiving just isn't the same since my mom passed away though. I have such wonderful memories of my mom getting up early and cooking her traditional Thanksgiving dinner. Her birthday is this Saturday (Nov. 17th) and she's been on my mind a lot lately! It's been about a year and a half since she passed away and I sure do miss talking to her! I feel so thankful to have had such a wonderful mom! Happy Birthday Mom! I know you are watching over me! That is a beautiful table. I loved seeing it again. Thanks for hosting Cindy. Have a great Thanksgiving. I love this table! Very pretty. Blessings to you this Thanksgiving! Hi Cindy: I love the Thanksgiving table that you set. The glass turkey bowls are a very neat idea, and I love the blue and white turkey dishes as well. I am glad that you have happy memories of your mother, and I wish you a fabulous Thanksgiving this year. Ours is going to be quiet with just my sweetie and I. Thank you so much for hosting the party for us tonight. Thanks so much for hosting another fabulous party! Love your Thanksgiving table! I love that beautiful table setting. Hope you enjoy your Thanksgiving dinner at your Dads. Cindy, Your table is beautiful...love the blue. Blue and white is never out of style no matter the season. I am sorry about your Mom. I lost my Mom and Dad many years ago. Those first Holidays are so sad to get through..and then it kind of smooths out and you look back and smile with the memories because the pain is lessened. My mom passes away 11 years ago, and I still remember the smell of her cooking around the holidays. So, I understand. Cherish your beautiful memories, and enjoy your family. Thanks for hosting. Happy Birthday to your mom. I am so sorry you have to be without her. This is a gorgeous tablescape! Thanks so much for hosting! Hope you have a wonderful Thanksgiving. Lovely table setting, Cindy! Thanks for hosting. The holidays are not the same without our loved ones who have passed away... at least you have many beautiful memories of your mum to look back on. Hi, Cindy! What a fun party! It's great to be linking up with so many talented ladies! Thank you for hosting! Thank you so much for hosting a wonderful party Cindy, I love the Turkey candy bowls for soup! Your table styling is so nice. Love the glass turkey ! Here in France we can find hens, ducks but not turkeys, but we don't celebrate Thanksgiving ! Your Thanksgiving Tablescape is to die for. The little clear glass Turkey dish is unique! I love it! Thank you so much for hosting Cindy! Have a great weekend! I had lunch with a couple last weekend and she has the clear turkey dishes like yours. 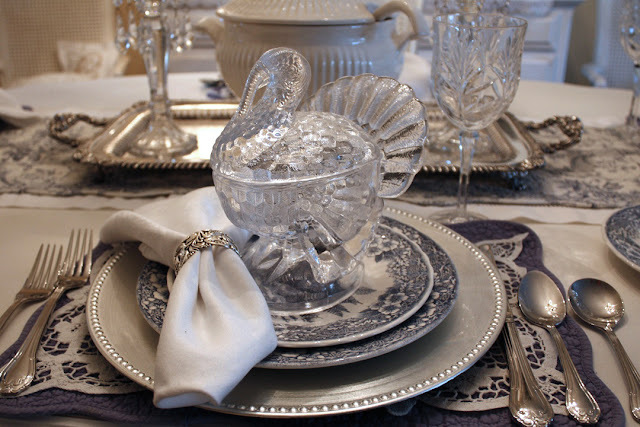 Beautiful table scape and I just love those glass turkey candy dishes. Thanks for hosting and have a Happy Thanksgiving! Cindy, your table looks beautiful. Have a Happy Thanksgiving. Memories of your Mom will last forever and happy birthday to her. What a beautiful table, Cindy. I hope you have a wonderful Thanksgiving! Thanks so much for hosting each week. Love your turkey theme....thank you for hosting, too! I adore a well set table! Yours is amazing, I especially love the idea of using the turkey candy dishes for soup. Of course your dishes are lovely, as well. 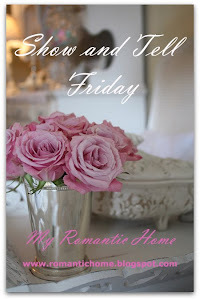 Since I was not a follower last year, I particularly appreciate you sharing it once more! This year my dad passed away and I know how you feel. I miss him every day. Happy memories are the greatest things in life to cherish and I'm glad you have great ones of your mom. The table looks so elegant!! I love the turkey candy dishes and you using them for soup bowls. 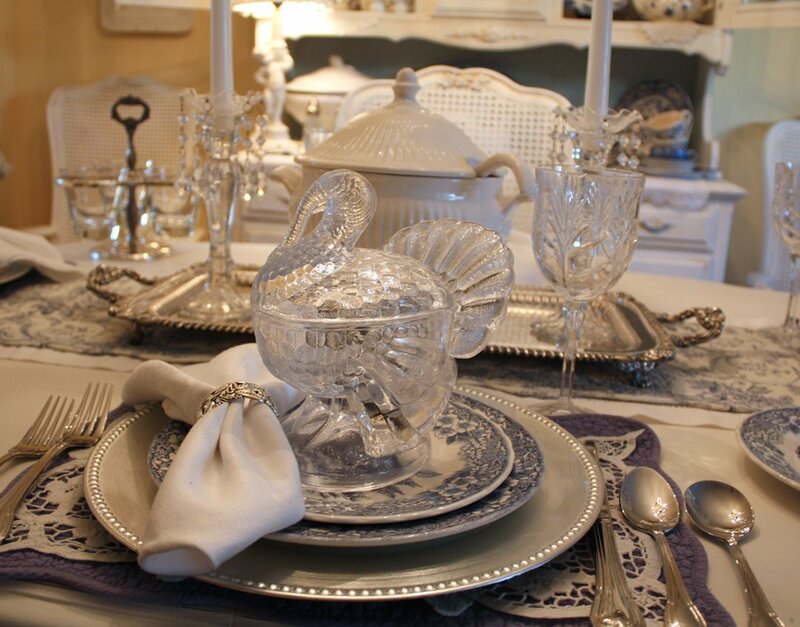 Your Thanksgiving tablescape is lovely! I adore the blue turkey plates! Marshalls is the best : ) Everything looks so pretty! Cindy, Love your home I just recently starting looking at your blog.Your thanksgiving table looks so gorgeous maybe you can have a quick meal on those dishes this weekend. I know what you mean about your mom, we usually have Thanksgiving each year at my home but my mother in law just passed away November 6th so my husband did not feel like having all these people over celebrating, I still can't believe she is gone you probably feel the same way and it is harder because during the holidays we have such great memories of family that passed.